In the West Block of Grasslands National Park is the Ecotour Route which runs through the Frenchman River Valley. This dirt road is the Frenchman River Valley Ecotour Route. The dirt road runs through a grassy valley with a grouping of hills in the background. 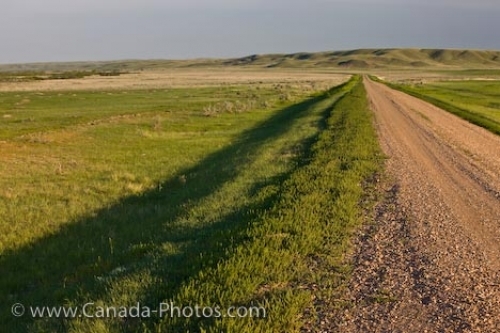 Grasslands National Park is located in the southern Saskatchewan, Canada. Frenchman River Valley Ecotour Route through the Frenchman River Valley in the West Block of Grasslands National Park, Saskatchewan, Canada.